Tandy Jr. and Tisha Pike of Nevada, Mo., are proud to announce the birth of their son, Taiten Tandy Pike. 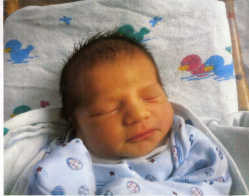 Taiten was born at 12:08 p.m., Wednesday, March 14, 2012, at Nevada Regional Medical Center. He weighed 8 pounds, 2 ounces, and measured 21 inches. Maternal grandparents are Roger and Tammy Underwood of Harwood, Mo. Maternal great-grandparents are Daurell Kaye of Harwood, Mo., and Earl Underwood of Nevada. Paternal grandparents are Tandy and Carmen Pike of Nevada. Paternal great-grandparents are Tandy and Evelyn Pike of Sheldon, Mo., and Bob and Gretta Colopy of Nevada.